Kronokare super powerful SPF 50 sunscreen lotion ensures the highest protection against UVA and UVB.Formulated without silicone, our lotion does not clog pores and allows the skin to breathe. With its super light texture, it gets quickly absorbed and ensures both a matte finish and non greasy touch. Water resistant, our lotion guarantees optimum protection. Simply, the best shield against sun and premature skin ageing. Explore the entire range of Body Sunscreen available on Nykaa. 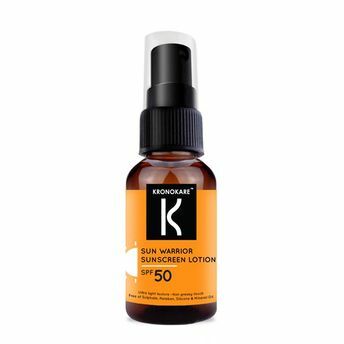 Shop more Kronokare products here.You can browse through the complete world of Kronokare Body Sunscreen .Alternatively, you can also find many more products from the Kronokare Sun Warrior Sunscreen Lotion range.